After Ellie’s birthday party I fought race traffic going home, freshened up, brushed off all the hay, fought more race traffic, and finally made it uptown to dinner with the girls. I’m writing this on my iPhone so I don’t know how to link to anything from here, be patient with me. We met up at Rock Bottom for a yummy dinner. Susan, Shannon HG, Jenny, & Sarah- who had flown in from AZ for the weekend. After dinner and a fabulous Caribbean margarita we piled in my car & went to Howl at the Moon. 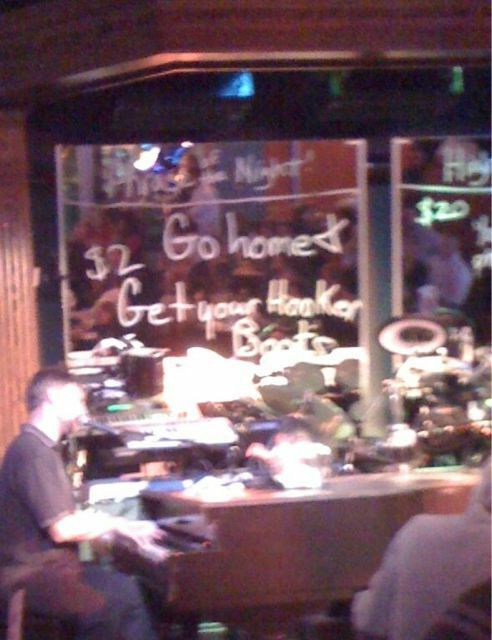 Howl is a dueling piano bar. I’d never been to one before. SO fun! We got there early & scored a great table. People write requests for songs & send them up to the pianists with $$. Then we all sing along. Let me tell you, I’m not a bar girl. I can not tolerate cigarrette smoke. I don’t like yelling at people when trying to make conversation. But this place? This place I love! It didn’t get too smoky. It’s loud, but fun loud. The musicians are really, really talented & funny. I can’t wait to go back! By the time I got home I’d lost my voice from all the yelling & singing & laughing. So worth it. We had the best time & it was so great to spend time with my girls! Still amazes me that you southerners allow smoking in bars and restaurants! It is all smoke free here! We have a howl at the moon and they can be so fun! Oh how I wish there was no smoking in restaurants & bars here! Fun!! We just discovered a fun dueling piano bar here. And smoke-free too!! Love that law! guess what??? starting jan. 1, 2010 there will be NO MORE smoking in restaurants in north carolina. how fabulous is that??????????? ?